To purchase a 3-in-1 recording of songs from SUNNY, SHOW BOAT and LIDO LADY, click on the image above. Although the month is swiftly drawing to a close, there’s still time to take a look at another of the forgotten musicals created by Richard Rodgers and Lorenz Hart during the 1920s. This week, I’m having a look over Lido Lady (1926), which was different from the previous Rodgers and Hart musicals for a couple of reasons. Firstly, it was a project that had its origins in London. Jack Hulbert was planning to produce a play as a vehicle for his wife, Cicely Courtneidge, and himself. He wanted Rodgers and Hart songs for the play, and so he hired the pair to write some material for the show. This was all the more remarkable, because Rodgers and Hart had yet to have a hit in London, a city that had not seen productions of Dearest Enemy or The Girl Friend. Secondly, the script had already been written, so Rodgers and Hart were seeking out and writing for obvious song spots rather than creating original material with someone like Herbert Fields as they went along or tailoring previous songs to fit new situations being contrived within the bounds of their theatremaking team. As per tradition when it came to musical comedies in the 1920s, Lido Lady didn’t amount to much plot wise. Set in Venice, on the Lido, Fay Blake is the tennis-playing daughter of a wealthy sports goods manufacturer. Amidst all sorts of romantic shenanigans, there is some business about a tennis ball design going missing – and that’s about it. Added to the songs Rodgers and Hart composed for the piece were “It All Depends on You” from Buddy de Sylva, Lew Brown and Ray Henderson’s Big Boy and “Tomorrow the Skies May Be Gray” (“But Not Today”) by Con Conrad. Now it’s time to pick a favourite and least favourite song from the show. As a favourite, I am going to choose “Try Again Tomorrow”, which was a duet for Courtneidge and Hulbert, who played siblings it the show. I like it because it’s a catchy and witty little number that makes me chuckle. Just a couple of minutes of unadulterated fun. My least favourite song in this show is a bit “out of the box”, so to speak. 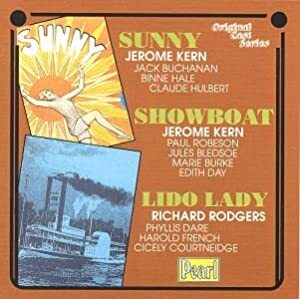 Although more than a dozen new songs were written for Lido Lady, the hit song of the show turned out to be “Here in My Arms”, which Rodgers and Hart lifted from Dearest Enemy. Now I generally dislike the tradition of shifting songs around willy-nilly in that fashion, but because Dearest Enemy had been such a big hit and because of the fondness I’ve developed for it over the past month, I dislike this particular case even more. It’s difficult to argue for any kind of respect for the much maligned 1920s musicals, even the ones that do hold together relatively well, when the arguments for revising 1920s musicals focus on the point that the positioning of and motivation for the songs within the show was negligible and when the creators themselves sometimes behave as though that’s true. I’d agree that while there is almost always some streamlining to do should one want to revive these musicals for anything other than pure historical interest, not every revival of shows from the 1920s needs to be revised from top to bottom for commercial purposes and that the adjustments should be made carefully. Of course, there are some 1920s shows that can’t be revived for anything but pure historical interest, but that’s just the way it is. Some things are meant for the history books and for historical reconstructions. For those of you who made it all the way down to the end of the column, here’s a special treat: a link to some video footage the original production. Enjoy! Want to add your own thoughts about Lido Lady? Share your thoughts in the comment box below. In the meantime, I have to decide what Forgotten Musicals to discuss during Fridays in April. I’ve had such a good time with Rodgers and Hart, that I’m inclined to stick with them for a while. Any thoughts? This entry was posted in Forgotten Musicals Friday and tagged Big Boy, Buddy de Silva, Cicely Courtneidge, Con Conrad, Dearest Enemy, Forgotten Musicals Friday, Herbert Fields, Jack Hulbert, Lew Brown, Lido Lady, Lorenz Hart, Ray Henderson, Richard Rodgers. Bookmark the permalink.